H.M.S. 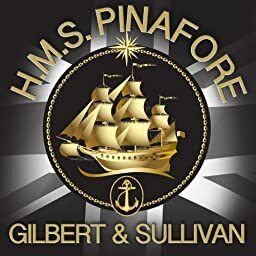 Pinafore (The Lass that Loved a Sailor), Act I: "We sail the ocean blue"
H.M.S. Pinafore (The Lass that Loved a Sailor), Act I: "Hail, men-o'-war's men"
H.M.S. Pinafore (The Lass that Loved a Sailor), Act I: "But tell me, who's the youth"
H.M.S. Pinafore (The Lass that Loved a Sailor), Act I: "A maiden fair to see"
H.M.S. Pinafore (The Lass that Loved a Sailor), Act I: "My Gallant Crew, good morning"
H.M.S. Pinafore (The Lass that Loved a Sailor), Act I: "Sir, you are sad"
H.M.S. Pinafore (The Lass that Loved a Sailor), Act I: "Sorry her lot who loves too well"
H.M.S. Pinafore (The Lass that Loved a Sailor), Act I: "Over the bright blue sea"
H.M.S. Pinafore (The Lass that Loved a Sailor), Act I: "Gaily Tripping"
H.M.S. Pinafore (The Lass that Loved a Sailor), Act I: "Now give three cheers...I am the monarch of the sea"
H.M.S. Pinafore (The Lass that Loved a Sailor), Act I: "When I was a lad I served a term"
H.M.S. Pinafore (The Lass that Loved a Sailor), Act I: "For I hold that on the sea"
H.M.S. Pinafore (The Lass that Loved a Sailor), Act I: "A British tar is a soaring soul"
H.M.S. Pinafore (The Lass that Loved a Sailor), Act I: "Refrain, audacious tar"
H.M.S. Pinafore (The Lass that Loved a Sailor), Act I: "Oh joy, oh rapture unforeseen"
H.M.S. Pinafore (The Lass that Loved a Sailor), Act II: "Fair moon to thee I sing"
H.M.S. Pinafore (The Lass that Loved a Sailor), Act II: "Things are seldom what they seem"
H.M.S. Pinafore (The Lass that Loved a Sailor), Act II: "The hours creep on apace"
H.M.S. Pinafore (The Lass that Loved a Sailor), Act II: "A simple sailor lowly born"
H.M.S. Pinafore (The Lass that Loved a Sailor), Act II: "Never mind the why and wherefore"
H.M.S. Pinafore (The Lass that Loved a Sailor), Act II: "Kind Captain, I've important information"
H.M.S. Pinafore (The Lass that Loved a Sailor), Act II: "Carefully on tiptoe stealing"
H.M.S. Pinafore (The Lass that Loved a Sailor), Act II: "Pretty daughter of mine"
H.M.S. Pinafore (The Lass that Loved a Sailor), Act II: "Farewell my own"
H.M.S. Pinafore (The Lass that Loved a Sailor), Act II: "My pain and my distress"